Head USA is recalling six models of helmets sold from January 2015, through December 2015 because the “helmets do not comply with the impact requirements of safety standards for helmets.” In other words, the helmets are not actually helmets. 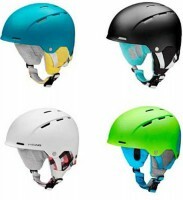 This recall involves six models of HEAD ski and snowboard helmets: Agent, Alia, Andor, Arise, Arosa and Avril. They were sold in sizes M/L and XL/XXL in black, blue, green white and yellow, with straps in a variety of colors. . . HEAD, the model name, size and “Production Code: Dec. 2014” are printed on stickers that can be found by lifting the lining above the right earpiece. If you are one of the 440 people who bought one of these helmets please contact Head at 800-874-3235 from 9 a.m. to 7 p.m. ET Monday through Friday or online at http://www.head.com/index.php?id=1313.